Set during the aftermath of the Jack the Ripper murders in London’s East End, and currently filming in Dublin, the eight-part series from BBC America follows the Metropolitan Police H Division as they investigate the deaths. 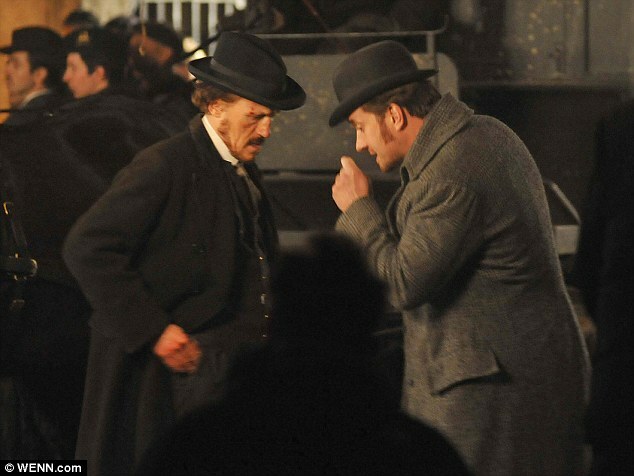 ‘Ripper Street’ is set in and around Whitechapel in London’s East End in 1889, during the aftermath of the Jack The Ripper murders. The action centres on the notorious H Division, which is charged with keeping order in the chaotic streets of East London. 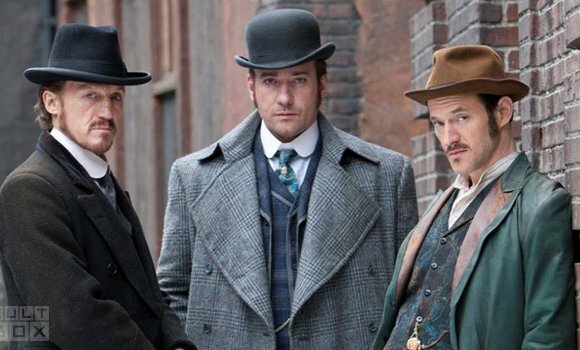 Jerome Flynn has been cast as detective sergeant Bennet Drake, Macfadyen as detective inspector Edmund Reid, and Adam Rothenberg as Captain Homer Jackson. 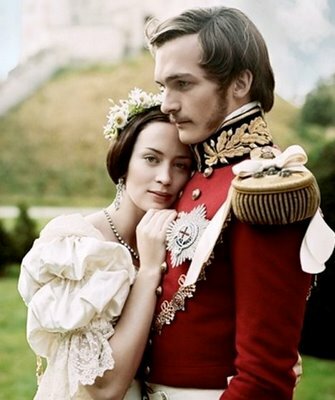 This is an old BBC miniseries from 2003, which is the basis for the Russell Crowe movie with the same title. The basic story is the same, revolving around the death of a young woman who was working for, and having an affair with, a politician. In the movie, the main journalist investigating the story is an old friend of the politican, while in the miniseries, he was his former campaign manager. I thought this was a bit odd, moving from politics to straight reporting – Cal is an investigative journalist, not a pundit or columnist – but maybe that’s actually common in the UK, I don’t know. Not surprisingly, I enjoyed the miniseries a lot more – it has more time to develop the story, it doesn’t have the super annoying bloggers-are-not-real-journalists preachy storyline, instead of Cal (Russell Crowe) acting like a cowboy investigating on his own most of the time and helped occasionally by Della (Rachel McAdams) the female sidekick, the investigation in the miniseries felt more like a true team effort between Cal, Della and three other reporters. 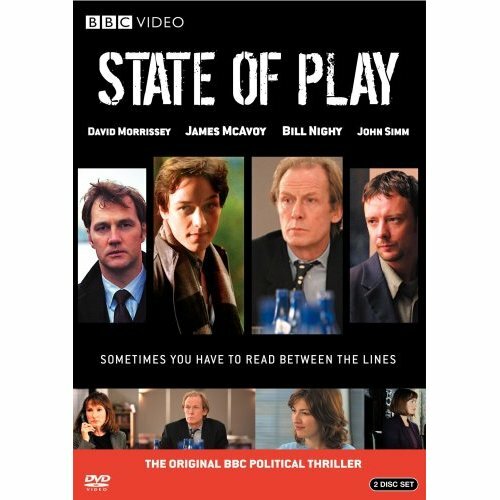 (Check out James McAvoy in his pre-movie star days as one of the reporters, who also happens to be the editor’s son). And finally, even though Helen Mirren usually can do no wrong with me, Mirren’s editor pales in comparison with Bill Nighy’s sarcastic, delightful portrayal. A bit of a letdown after all my anticipation. Nighy plays an MI5 officer (with the delightful name Johnny Worricker) who after the sudden death of his boss (Dumbledore as the Director General of MI5!) came across a secret involving the British government – that the Prime Minister (played by The Dark Lord Voldermort himself, heh), despite repeated denials, knew that the US had been torturing prisoners (including British citizens) in secret overseas prison. In addition, the PM also knew the locations of these secret prisons, and presumably could have intervened on behalf of the British prisoners, but chose not to. There’s a complicated family story – Johnny’s boss is married to his ex-wife, Johnny has a distant relationship with his artist daughter who has a secret of her own. There’s also a love story (or is it?) between Johnny and a neighbor played by Rachel Weisz, who has her own agenda. It sounds exciting on paper, but a little bit dull on screen, to be honest. And the ending provokes this question – do you expose a secret that will presumably bring justice for many, many people, or expose a secret that will bring justice for one particular person, who happens to be the brother of a woman you care about? Maybe it’s human nature to choose the latter, but I think you lose your moral high ground once you’ve done that. 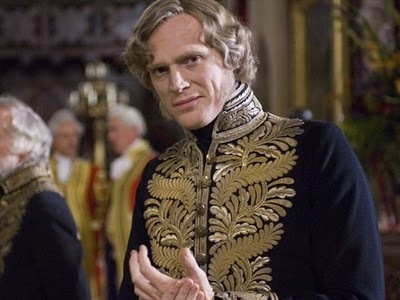 I’m going to be really, really shallow here, and confess that my enjoyment of this actually quite good movie is seriously, seriously spoiled by the fact that I JUST DON”T UNDERSTAND how the young Queen Victoria can choose the drippy, annoying Albert over Paul Bettany’s charming, delightful Lord Melbourne. Well, obviously the answer is: history! !, but in that case, maybe the movie should have cast someone more charismatic than the bland, boring, seriously-he’s-worse-than-Orlando-Bloom, Rupert Friend to play Albert. What woman in her right mind would choose him over Paul Bettany??? Does.not.compute. 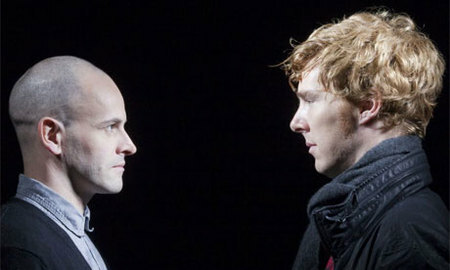 Mark Strong is excellent as the baddie, though. Oh snap! This is so hilarious. I’m alternating between disgust and awe at CBS’ audacity. 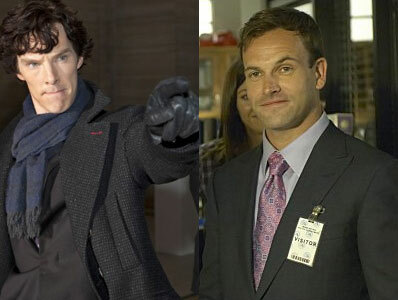 Due to the possible legal issues, I bet Miller’s character won’t even be called Sherlock Holmes, he’ll be Merlock Polmes or something with his sidekick Dr Batson. And how many Sherlock Holmes’ stories are there anyway? I don’t think they can sustain 22 episodes per season. That said, the way they are staring at each other here …. move over Watson, there’s a new guy in town!